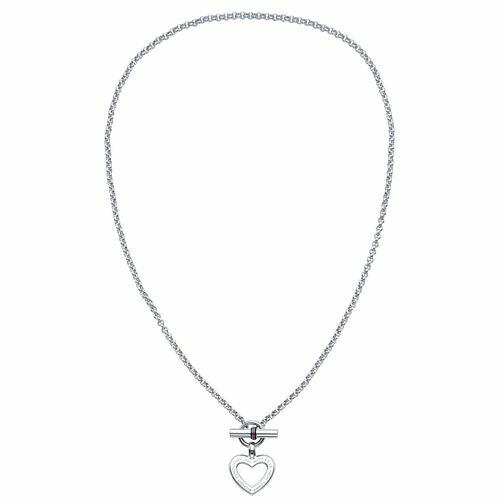 Get sweet style and American chic design with this stainless steel heart toggle necklace from Tommy Hilfiger. With a toggle featuring the recognisable Tommy Hilfiger colours and a heart cut-out pendant engraved with the Tommy Hilfiger logo, this necklace offers casual style and quality of design. Tommy Hilfiger Stainless Steel Heart Toggle Necklace is rated 5.0 out of 5 by 1. Rated 5 out of 5 by Anonymous from Perfect gift for loved one Perfect designer necklace, very nice and basic design.